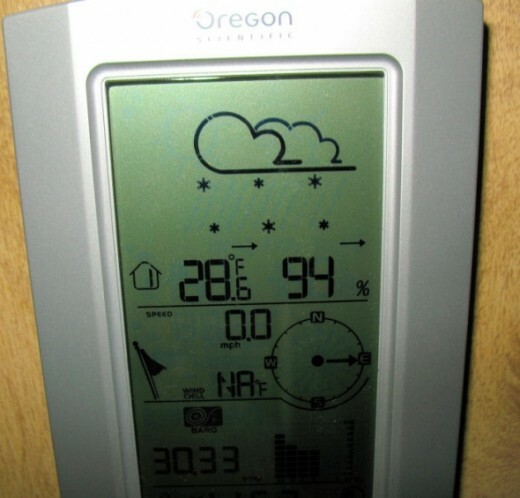 My Weather Station – Best Christmas Gift Ever! My Oregon Scientific Weather Station is Lots of Fun! I’m always been interested in science, and I’d like to share with you a terrific present I got for Christmas. It’s a weather station that tells me the inside and outside temperatures, plus other fun things like wind speed and air pressure! If you are looking for a gift for someone who enjoys science, or weather in particular, you might consider buying a weather station – and there are some really impressive low cost models, as well as professional ones. I’ve personally given a simple weather station as a gift several times, and it’s never failed to please. I like my weather station so much, that I have it placed just under my TV, so I can even watch it while watching TV! But I’m kind of crazy that way. I like to see the outside temperature, and inside temperature, the change in air pressure, and the weather prediction. (Above) Here’s a picture of my weather station, showing a typical day in rainy Washington state! It’s 42 degrees outside, 98% humidity, no wind, and .17 inch of a rain in the last day. 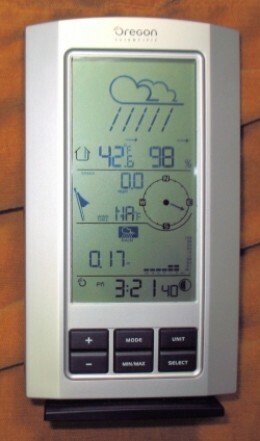 On this particular model, you have to use the buttons to change the display, if you want to see the barometer graph or the inside temperature. Oregon Scientific Weather Station Forecasts Snow! One of the most exciting weather events is snow! Especially in a place that doesn’t get too much snow, it’s sure a lot of fun to have a weather station come out with the right prediction! This weather station is supposed to forecast the weather condition for the next 12-24 hours. Of course, it doesn’t have the benefit of knowing whether there are clouds in the sky (or clouds on the way), but it seems to forecast based on temperature, barometer pressure and humidity. Surprisingly, it is often very accurate! A couple of times during this past winter, we saw snow predicted on the Oregon Scientific weather station, and thought “No way!” but then we would look outside, and sure enough, there would be flurries! Pretty cool! A Weather Station Like the One I Own – A year later, a better deal with more features for less money…. I could recommend that you buy the same model I own, but there’s a better one out there. Although my model has held up well, it actually hasn’t gotten very good reviews on Amazon. Plus, for about the same price, you can get this model, which has some extra features that I would have liked. 1. It shows both the Inside and Outside temperatures at the same time! 2. It can connect to your computer. 3. It keeps up to 1 month of rainfall total. This is far better than my model, which gives only a 1 day total. 4. It got way better reviews than my model. Although I didn’t have any problems with mine, apparently I lucked out. The Most Fun Weather Station! – Ideal for children, teens, and people who love the weather! This one stands out in my mind because it has a picture of a person (“Oscar”) wearing weather suitable clothing. This picture changes depending on the forecast. This is especially cute and would be ideal for children. It also would make a great conversation piece for the living room table. I love to compare how often my weather station gets the weather forecast right compared to the human on TV. You’d be surprised! Oregon Scientific Electronic Rain Gauge – Another Great Weather Related Gift Idea! Aside from temperature, rainfall (or precipitation) may be the next most watched weather event. If you live in a place that has particularly interesting rainfall amounts (lots of it, or very little!) then a rain gauge might be a particularly fun gift for the weather enthusiast! It’s also a nice gift for farmers and gardeners! Many people already own electronic thermometers, so if you are afraid of buying something that a person might already own, then an electronic rain gauge might be a better bet than just an ordinary weather station! How Accurate is your Weather Station? Compare yours to nearby Weather Stations! I like to look up the weather at Weather Underground. If you put in your zipcode, you can then scroll to the bottom of the page where it lists the data from nearby weather stations. This is the best way I’ve found to check my weather station against others. If you have a weather station that connects to the computer, you can even add your weather station to Weather Underground so that other people can see your data!